Lamar and Top Dawg Entertainment CEO Anthony “Top Dawg” Tiffith produced the soundtrack for the upcoming “Black Panther” movie starring Chadwick Boseman, with the first single “All the Stars” featuring Lamar and SZA. “The magnitude of this film showcases a great marriage of art and culture,” Lamar said in a statement. “I’m truly honored to contribute my knowledge of producing sound and writing music alongside Ryan [Coogler, the film’s director] and Marvel’s vision.” After making huge splashes in both the movies and sports world with their recent moves, TDE is ready explode again on the music scene with their first ever full label tour featuring Kendrick Lamar, SZA, ScHoolboy Q, Jay Rock and more. 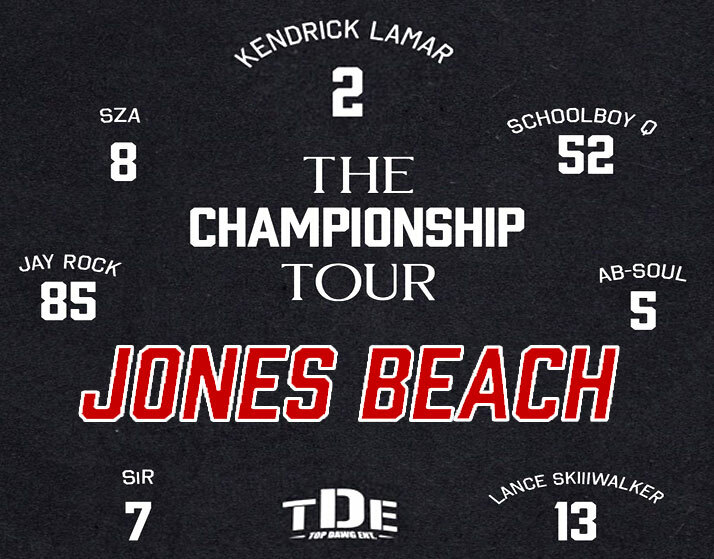 Dubbed The Championship Tour, Top Dawg Entertainment's elite roster is slated to kick off their multi-city jaunt May 4 in Vancouver. In 2017, TDE trounced the competition with masterful efforts from Lamar and SZA. DAMN. and CTRL earned platinum status and also secured a bevy of Grammy nominations. This year, Lamar is up for seven Grammys, while his TDE female counterpart, SZA, is up for five awards including best new artist. Aside from the music aspect, TDE's foray into sports and entertainment have also been well documented. Last week, they signed LSU running back Derrius Guice to their new sports agency. Earlier this month, TDE announced that they're producing Black Panther: The Album for the forthcoming Ryan Coogler-directed film. So far, they released two songs including Kendrick Lamar and SZA's "All the Stars" and Jay Rock's starry record "King's Dead" featuring K. Dot, Future and James Blake. For the first time ever, the entire Top Dawg Entertainment roster will tour together. That means Kendrick Lamar, SZA, ScHoolboy Q, Jay Rock, Ab-Soul, Isaiah Rashad, SiR, Lance Skiiiwalker and even more TBA on one tour, and that also hopefully means live renditions of the many TDE collaborations. Kendrick and SZA released our two favorite albums of 2017 and SiR released his new album November just last week (featuring the Schoolboy Q collab “Something Foreign”). Kendrick and TDE CEO Anthony “Top Dawg” Tiffith are curating the Black Panther soundtrack, which includes the Kendrick/SZA collab “All The Stars” and the Jay Rock/Kendrick/Future/James Blake collab “Kings Dead,” which is also the lead single off Jay Rock’s upcoming album. Kendrick and SZA are also performing at the Grammys at MSG this month.